KANSTANTSIN YASKOU - composer, arranger, conductor; Ph.D.
1997-2001. The State College of Music in Grodno: piano (teacher Bruno Termen) and composition (teacher Vitaly Rodionov). 2001-2006. The Belarusian State Academy of Music: composition (prof. Viktor Vojtik) and conducting (prof. Nikolai Kolyadko). Kanstantsin Yaskou composes music in various genres and styles. He participates in numerous projects, concerts, festivals of contemporary music and contemporary art in Europe and America (Belarus, Russia, Ukraine, Poland, France, Netherlands, Malta, Venezuela, USA). He cooperates with professional and amateur collectives, musicians from Belarus and Europe. Among the customers and performers of his music are: The State Academic Symphony Orchestra of the Republic of Belarus (art director and chief conductor Alexander Anisimov), The State Chamber Orchestra of the Republic of Belarus (art director and chief conductor Evgeny Bushkov), Сappella Sonorus (art director and chief conductor Alexander Humala), Choir Salutaris (artistic director Olga Yanum), The National Ensemble of Soloists “Kyiv Camerata” (artistic director Valery Matyukhin), The Ensemble of New Music Nostri Temporis (Ukraine), The Ensemble of Modern Music “Ricochet” (Ukraine), String Quartet “Akademos” (Poland), Flute Quartet “Syrinx” (Russia); Andres Mustonen (conductor, Estonia), Friedrich Lips (Bayan, Russia), Zoltan Almashi (cello, Ukraine), Dariusz Przybylski (organ, Poland), Veranika Pradzed (Belarusian cymbaly, Belarus), Katsyaryna Maretskaya (piano, Belarus), Edyta Kszemien (soprano, Poland), Ales Curko (electronic, Belarus), Maria Kolesnikova (flute, Belarus-Germany), Yauhen Shymanovich (clarinet, Belarus), Olga Podgaiskaya (organ, Belarus) and others; educational collectives of The Belarusian State Academy of Music and The Belarusian State University of Culture and Art. During the season 2016-2017 he collaborated with The State Chamber Orchestra of Belarus as a composer-in-residence. In the field of applied music he collaborated with The Republican Theater of Belarusian Drama, film studio “Letapis” (“Belarusfilm”), Keepforest studio. Kanstantsin Yaskou is the author of more than 100 musical arrangements in various genres and styles. The central place in his creative activity occupy arrangements for symphonic orchestra of classical music, pop music, rock music and film music. There are lots of arrangements of musical folklore (Belarusian, Russian, Ukrainian) for vocal ensembles and choirs. 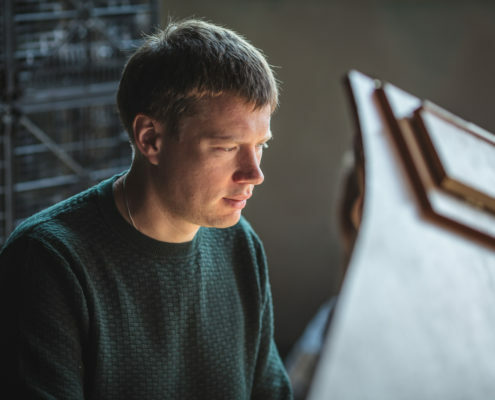 As an arranger, he collaborated with The National Academic Bolshoi Opera and Ballet Theatre of the Republic of Belarus, Janka Kupala National Theatre, Belkontsert, Keepforest studio [http://keep-forest.com/], professional, amateur and educational orchestras, vocal ensembles, choirs. Kanstantsin Yaskou has worked at The Belarusian State University of Culture and Arts at The Department of Belarusian Folk Art since 2008. He teaches disciplines related to the arrangement and musical transcription of Belarusian musical folklore and musical stylistics. From 2008 to 2017 he worked at The Belarusian State Academy of Music at the Department of Composition. He taught the analysis of musical forms, harmony, composition, computer technologies in composer’s creativity. Kanstantsin Yaskou has a degree Ph.D. (specialty musical art). He defended the dissertation Polystylistics in a composer’s creativity (based on the material of the chamber instrumental works by Belarusian composers of the early 21st century). He is the author of 12 scientific articles about process of composer’s creativity and polystylistics. He participated in numerous international scientific conferences. Kanstantsin Yaskou is an organizer and co-organizer of projects, concerts, festivals of contemporary music and contemporary art. He is a member of non-governmental organizations: The Belarusian Union of Musical Personalities (since 2001) and Belarusian Composers Union (since 2006). He constantlycooperates with Polish Institute in Minsk in the field of organizing and management of Polish-Belarusian musical art projects.